Students at Hidalgo Elementary School are helping to rescue animals as one of several projects taken on by the school's kindness club, K-Kids Club. 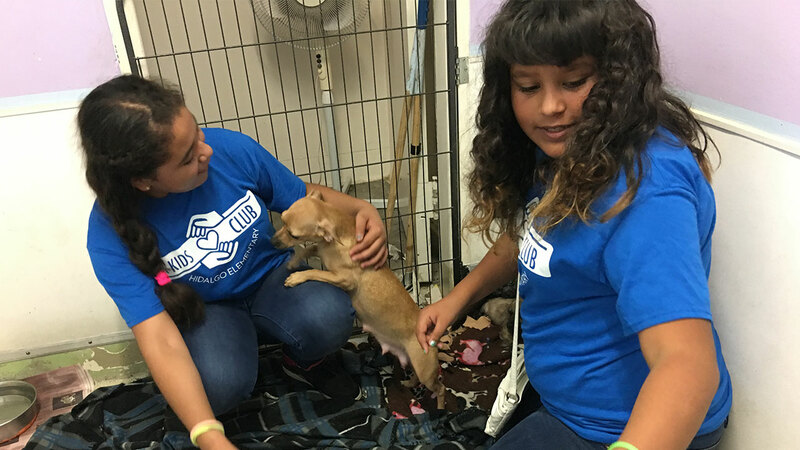 Once a month a group of about eight Hidalgo students volunteers at the adoption center of the Animal Compassion Team (ACT), cleaning the puppy and cat rooms, spending time with the animals, and any other projects needing support, said Jennifer Jones, a teacher at Hidalgo. For many of the students, it is their first opportunity to volunteer and they are learning what it means to serve the community they live in and to work toward a common goal with others. Hidalgo fifth-grader Karena Mendoza said she's learned the importance of being kind to animals. Hidalgo student Brian Garcia, also a fifth-grader, said volunteering at the adoption center was fun. "The animals we helped were very nice," Brian said. Students who volunteer at ACT are part of the community service committee of the K-Kids Club. Other committees include Room Buddies, Random Acts of Kindness, Meaningful Work, Peer Mediation, and Character Counts. The goal of the K-Kids Club is to spread kindness starting at the school, then at home, and then into the community.